PhiloSURFical is a pedagogical application, which allows the contextual navigation of a semantically-enhanced version of Wittgenstein's Tractatus Logico-Philosophicus (Wittgenstein, 1921). 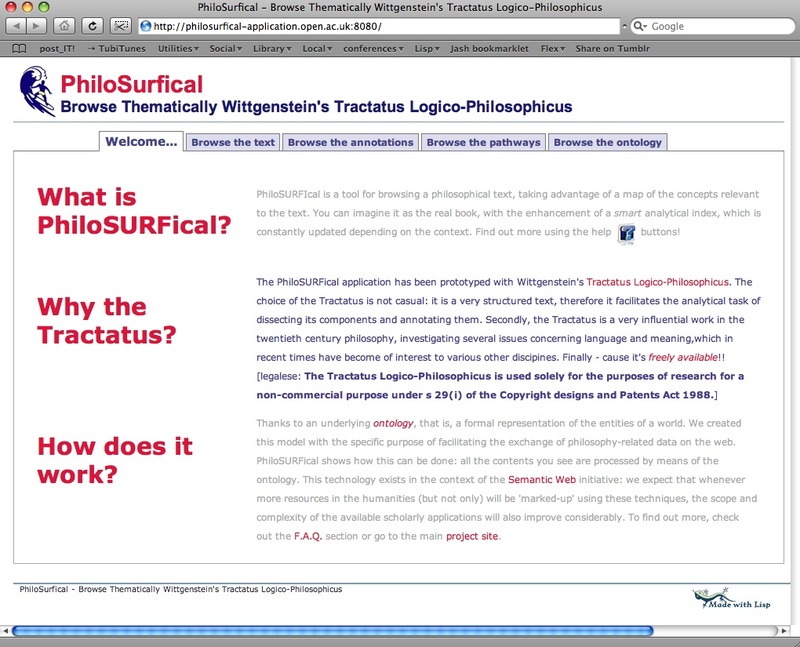 Essentially, PhiloSURFical was built to test the functionalities of the philosophical ontology we created. In fact, by relying on the multiple levels of abstraction provided by the ontology, the software lets users benefit from multiple perspectives on the text and on related resources. It is important to mention that, for bootstrapping purposes (as the availability of free and adequate philosophical semantic data on the web is still limited), PhiloSURFical strongly relies on an internal knowledge base created by us; nonetheless, its architecture aims to be open and extensible so to allow future integration and querying of different repositories, using the appropriate web standards. At the time of writing the prototype is mainly focused on browsing functionalities. 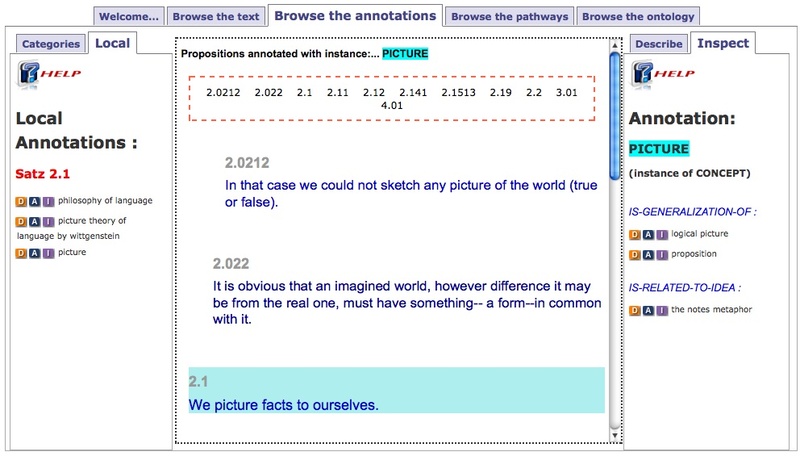 In future versions we plan to extend it so that users could also store their own annotations about the Tractatus and possibly contribute to the creation of a network of philosophical resources centered around the text and its author. 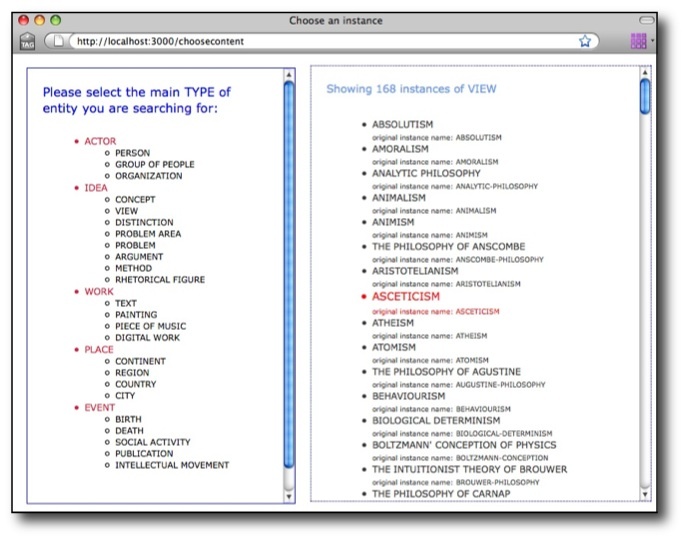 At a first glance, the PhiloSURFical tool can be described as organized into five sections or tabs. We attempted to organize the tabs' sequence according to their increasing difficulty of usage (namely, the first tab requires less 'learning effort' than the second one, the second one less than the third one, etc.). The five tabs can be briefly described as follows: the Welcome tab serves as a splash screen (see above) and provides some contextual information and links to relevant resources; the Browse the text tab presents three translations of the Tractatus' text in a simple but highly interactive interface; the Browse the annotations tab supports a different type of text navigation by means of a smart-index of the topics associated to the Tractatus' fragments; the Browse the pathways tab lets users select topics of interest and explore related resources by means of the 'learning pathways' facility; finally, the Browse the ontology tab visualizes the tree-hierarchy of the ontological representations PhiloSURFical relies on, allowing users to examine the underlying complexity of the model. In this tab users can simply browse the text, which is made available in three versions (the original German edition and the two major English translations). In order to facilitate this activity, a tree-like outline of the book on the left hand side lets them jump quickly to a specific paragraph. 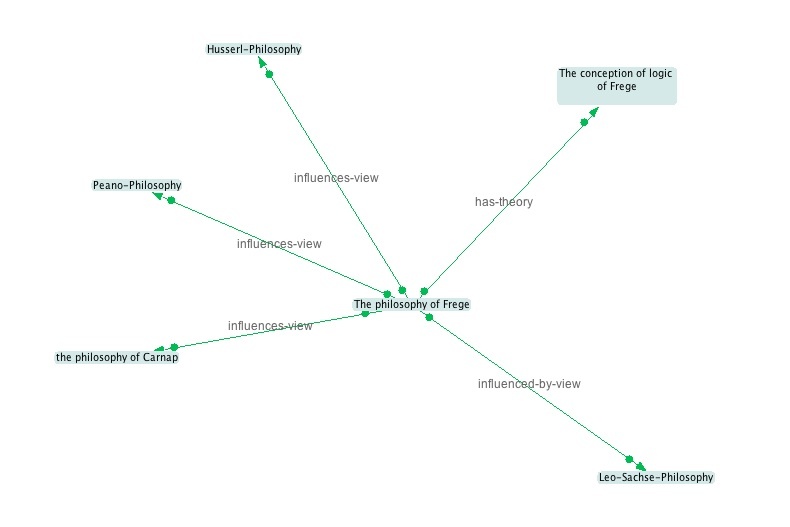 The interface also provides a handy overview of the highly hierarchical Tractatus' structure. This is where the ontological backbone of PhiloSURFical starts becoming more evident. At the centre of the screen users can still read the text, but now four panels, two on the right side and two on the left side, provide alternative ways to navigate the Tractatus. We can imagine this functionality as a 'smart index' of the text. That is, an index of the text's topics (i.e. the ideas being dealt with in the text) that is dynamically updated, depending on what text fragment the user is focusing on. It is important to remember, at this point, that all the Tractatus' interpretations we created are clearly just our view of the text's meanings. In other words, they are just some possible interpretations which, although we hoped being significant and thus capable of helping learners in understanding the text, could have been done differently. In other words, the interpretations are used here mainly as a way to showcase the functionalities of the tool (actually, in future releases, we would like to create an interface that supports users in creating their own annotations and possibly also sharing them). Let us now describe these features in more details, by going through the major functionalities of tab3. We can do so by imagining a real-world situation: e.g., a student who wants to know more about the notion of 'picture' in Wittgenstein. The student could start by looking up 'picture' in the categories panel (see figure below, on the left). Here we find all the topics associated with the text, organized into the eight idea-categories defined in the ontology. In other words, this panel acts as a general index where users can find quickly the contents they are interested in, or simply browse them to see what is available. In particular, the three little icons next to each topic serve to trigger operations on the other panels. For example, by clicking on the 'A' button (= annotations) our student can update the visualization in the central column, so that it will show all the text-fragments interpreted (= annotated) as being about the concept of 'picture' (see figure below, central column). 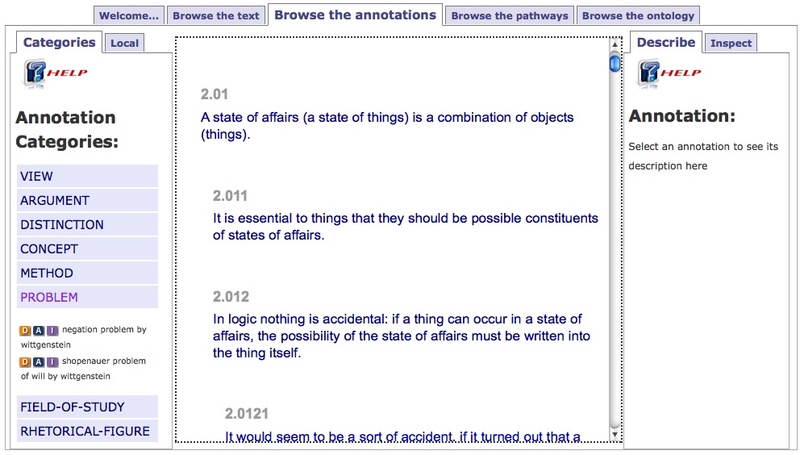 This is the first functionality this tab is offering to the user: by selecting a topic, it is possible to see only the sections of the Tractatus that have been associated to it. Secondly, by using the 'D' button (= describe) the student can read a short description of the topic just selected in the describe panel (see fig. above, on the right). This functionality aims at giving learners a first introduction to the selected topic. The description is stored in the knowledge-base thanks to a generic has-string-description property which is associated to each instance of propositional-content. Then the student may decide to start investigating the meaning of the concept of 'picture' by reading the text itself. In particular, let us imagine that he/she finds particularly interesting paragraph 2.1, so he/she wants to learn more about it. 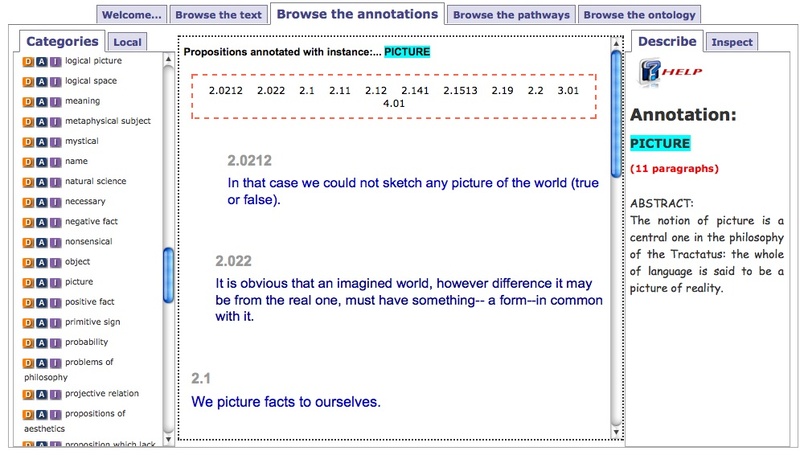 This can be achieved by clicking on the paragraph itself: in fact, by doing so the local annotations panel becomes active (see figure above, on the left). 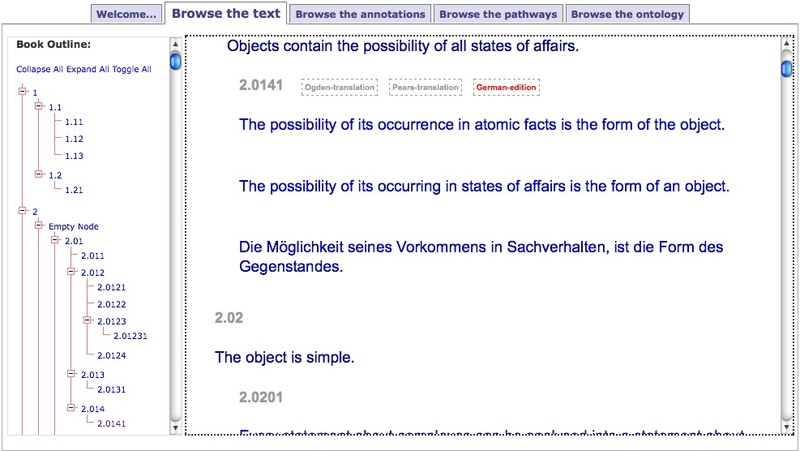 Here we can see which are the interpretations associated to a single text-fragment; also, by clicking on them, we can navigate the text in a non-linear manner. For example, our student might discover that the notion of 'picture' appears also in a 'picture theory of language', therefore he/she decides to select this new annotation and explore it further. Finally, after having explored a number of 'lateral' navigations starting from the 'picture' concept, our student might start feeling disoriented. In fact, although he/she has read about various topics which seem to be related to each other, it is not clear yet how they could all fit into a more generic map of Wittgenstein ideas. The 'inspect' panel addresses this problem (above, on the right). The panel, which can be activated by clicking on the 'I' button, shows a text-based version of a map of the various ideas related to 'picture'. Also here, the presented ideas are clickable and could be used for starting other navigations. 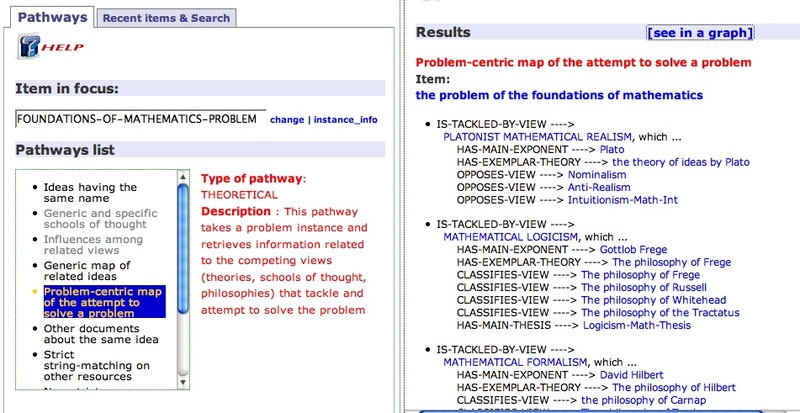 A 'pathway' is essentially a way to retrieve different instances and organize them into a coherent whole; in general, this result can be obtained thanks to the semantic relations formalized in the ontology or (in future releases of PhiloSURFical) by relying on the semantic mappings linking the ontology to other services available on the web. In more practical terms, learners start by selecting any content of interest (or just use the most recently selected content, which is 'in focus' by default) so to use it as the starting point of a pathway-navigation (see figure below). Once they have chosen an instance, learners may click on one of the available choices appearing in the 'pathways list' panel (see figure below). 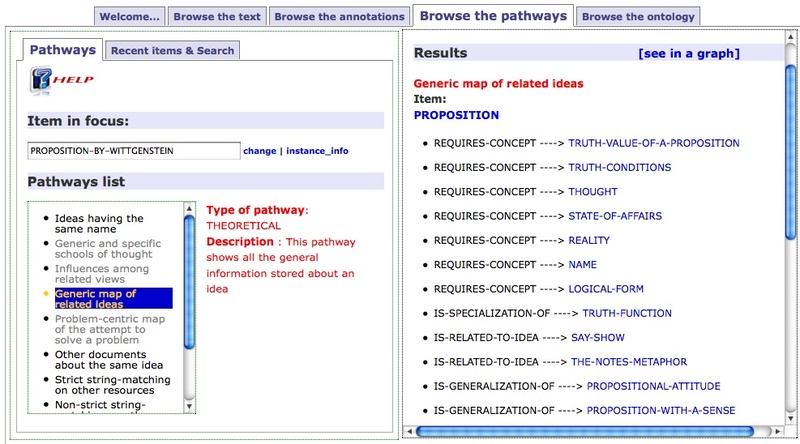 Each pathway-type has also a brief description explaining its meaning; such description is shown automatically every time the cursor moves over the items in the pathways list. Once a specific pathways gets triggered, the results are shown on the right panel as a set of interrelated entities. More precisely, results are displayed as a list of triples representing subject-predicate-object relationships. By doing so, the significant connections among the pathway's items are highlighted. In addition, results get organized into pathways-specific clusters that convey the idea of a coherent map to the user. Needless to say, by clicking on any item in the results' list it is possible to put the item into 'focus', and then start a new semantic navigation - this process can also be be describe as a recursive search process. In general, pathway-triggered navigations will usually produce results that go beyond the scope of the Tractatus: for example, starting from the instance of a person named 'Frank Ramsey' (as shown below), by using an historical pathway that highlights the chain of PhD advisors, we can find out that he is in the lineage originating from 'C.H.Weisse'. Instead, if we started from the 'problem of the foundations of mathematics' we might find more useful a problem-centric pathway, which is highlighting the concurrent views attempting to solve it (see below). It is also possible to view the pathways results' using a graphical visualization: e.g., in the figure below we can see the results of a theoretical pathway starting from the idea of 'Frege's conception of logic'. This section aims at familiarizing PhiloSURFical's users with the underlying technology the application is using. On the left hand side, by means of a tree-like menu it is possible to navigate the hierarchical structure of the ontology used to represent the Tractatus and all the other entities dealt with in PhiloSURFical. 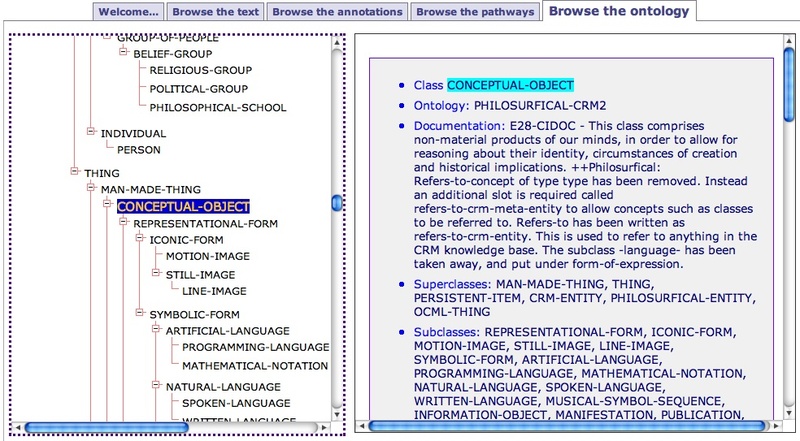 By clicking on the classes' names we can see their description on the right panel: this is composed by information about their position in the ontology (such as what super-classes or sub-classes they have), a natural language explanation of the classes' significance and the complete list of the properties linking them to the rest of ontology. For example, in the figure below it is possible to see the description of the conceptual-object class.